can cut to fit your job! By trade, an Interior Designers specialty is appearance. The folks at Creation by Lam Inc., based out of Richmond, Ohio, are more than interior designers; they are a collaborative team of professional developers/designers... magicians, really... who turn dreams and visions into reality. Michel Lam, the brilliant mind behind Creation by Lam Inc., combines aesthetics with functionality in the design of Prive Nail Salon Spa in downtown Maumee, Ohio. 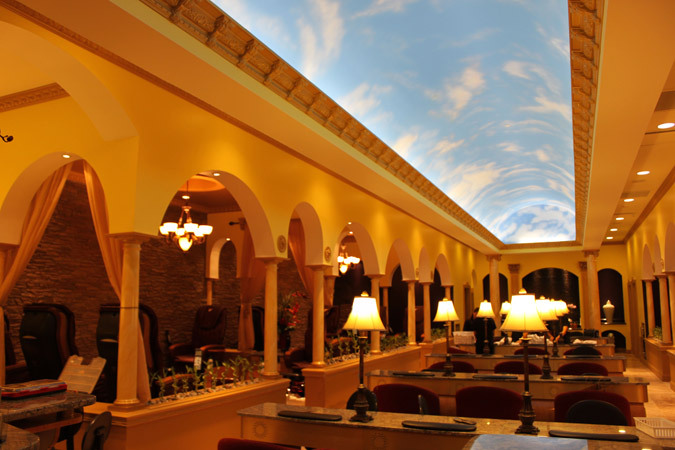 Michel sent us these incredible pictures of a Venetian Barrel Vault utilizing our CM-1059 and CM-1033 Crown Molding used in an unique atmosphere. Lam has created these amazing arches and pillars no less spectacular than the cloister below Blute Hall at The University of Glascow in Scotland. 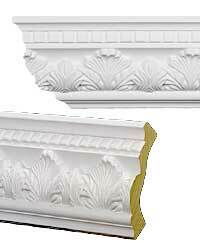 Our WC-9011 columns with Tuscany style capitals and bases are a perfect match for this architectural masterpiece. By removing the middle section of the 5 ft shaft, Lam was able to modify these versatile polyurethane columns to suit his needs. If you look closely, you can see what a master craftsman can do with a little faux-finish marble technique. Notice that at the very end of the Barrel Vault are two flat columns on either side of the center arch. Those are our EK-82240 Flat Columns. The chandelier just inside the pass-thru archway is mounted to a DO-5046 Ceiling Dome. 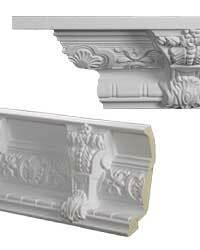 The sheer drapes are hung using our CB-1484 Bracket Corbels. The Lion is king so standing sentry on either side of the archway leading to the ante-rooms are ET-3852 Lion- Head medallions. Grrrr!